I have been writing Windows help files for nearly 30 years. It’s a very time consuming process to set up and maintain application help files. And just when I think I have a stable, workable system, Microsoft pulls the rug out from underneath me. With the introduction of Windows Vista in 2006, Microsoft deprecated WinHelp and no longer includes it with the factory images of Windows Vista, Windows 7 and Windows 8. I have never understood this. An intranet is an internal network, so why in the world would it be considered a security risk to open a file on your own internal network? Apparently, Internet Explorer (tightly integrated into the Windows OS), is not able to discern the difference between the internet and an intranet. Not until my PC at work was (finally) updated to Windows 7, did I realize that WinHelp is now just as useless as HTML_help. Windows 7 now blocks WinHelp from opening HLP help files stored on an intranet. Again, WTF? What is the security risk of opening a file on your own internal intranet? I could not find a trustworthy third party HLP file viewer, so I decided to switch to the CHM help format and seek out a replacement for Microsoft’s HTML_help viewer for intranet applications. After hours of web searching, I eventually found xCHM, a free, open-source, multi-platform, functional replacement for Microsoft’s HTML_help viewer. Although it doesn’t have all the bells and whistles, xCHM does, at least, open CHM help files stored on an intranet. 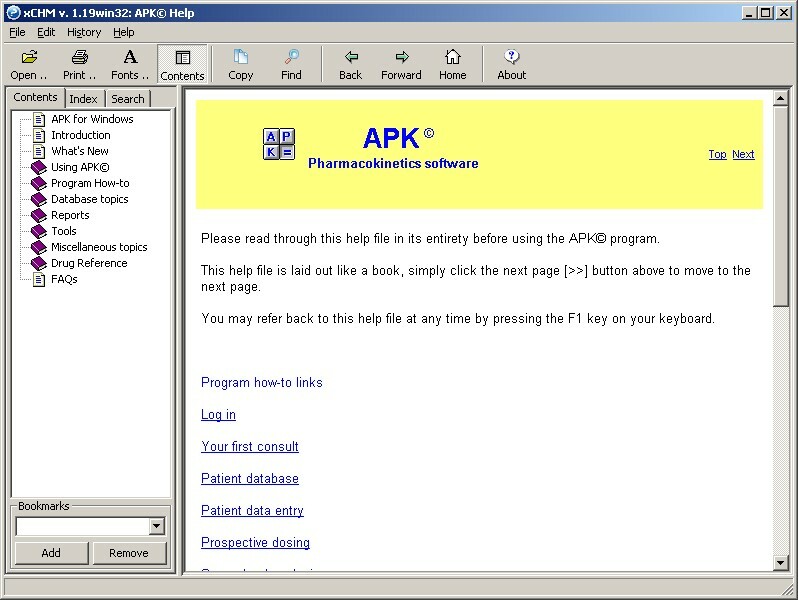 If the program is running from a local drive, the default help handling system is called. If the program is running on an intranet, and xCHM is available, then xCHM is called to display the relevant help topic. If on an intranet, and xCHM is not found, then an error dialog is displayed with a link to web help on rxkinetics.com. // Create parameter string -- Requires short path name! Looking back, this has probably been an exercise in futility. It seems as though most pharmacists either don’t know there is a help system built into the program, or they don’t care. Either way, no one has bothered to contact me to report a problem. Why am I not at all surprised?